On this weeks section of our Kyoto Photo-walk series we pick up from Kodai-ji temple and continue north west to explore the Gion district. Yasaka Shrine is at the eastern end of Shijo (fourth street) and is the major shrine of the Gion geisha district. Being right in central Kyoto and the gateway to Maruyama park we usually end up here several times during any stay. There are plenty of restaurants, traditional tea shops and a Starbucks at this end of Shijo so it’s a good spot to refresh and people watch for a while if that’s your thing – or is it just me? Just up Shijo to the left (when heading away from the Shrine) you can detour off into the Gion geisha district of Hanami-koji and to the right the Shirakawa canal area so I’ll include those here in this post too. Yasaka shrine, originally called the Gion shrine. It was established in 656 in the second year of the reign of Emperor Seimei, around 150 years before Kyoto (Heian) became the capital. Yasaka is still an important shrine in modern Japan with around 3000 sub-shrines located around the country. Amaterasu-Omikami (dieties of the heaven) and Susanoo-no-mikoto (dieties of Japan) are the Kami enshrined here. 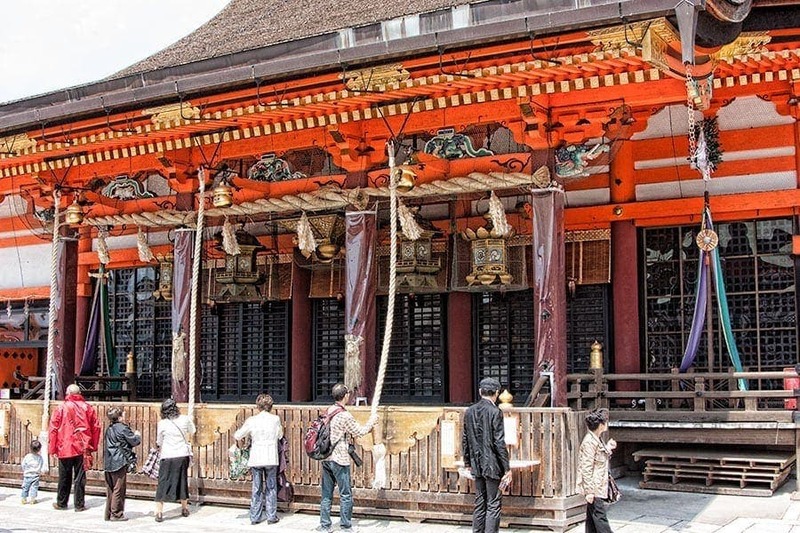 In the photo above you can see the worshipers in front of the shrine pulling on ropes which ring the bell to attract the Kami’s attention before they make their prayers. If you’re a little uncomfortable about visiting a Shinto Shrine I’ve written about the various tips we were given and picked up on our trips, just follow the link. 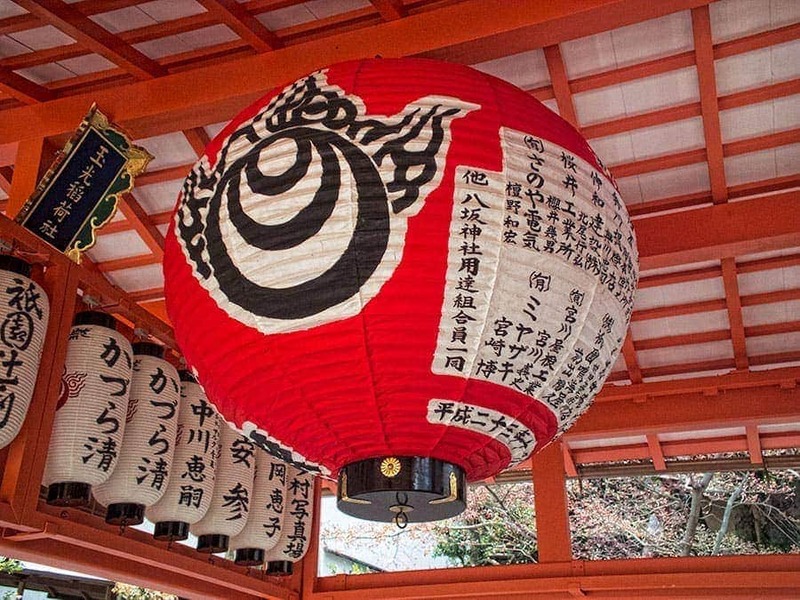 Major shines like Yasaka have many festivals through the year. One we attended here was for Setsubun which is the beginning of spring by the Japanese lunar calendar. It’s a celebration that involves spring cleaning the home, huge sushi rolls, people in Shrines throwing soy beans at you and various pantomimes featuring ogres. Just your average day really! Yasaka Shrine has a long association with geisha community and because of that one of the unique things that happens here on Setsubun Eve (2nd February) is the dance performances by Maiko from Kyotos various flower and willow districts. They happen on the main stage throughout the day. Maruyama-koen (park) is tucked in behind Yasaka Shrine and is a popular gathering place. It’s especially busy during sakura when it’s many cherry trees are in bloom. 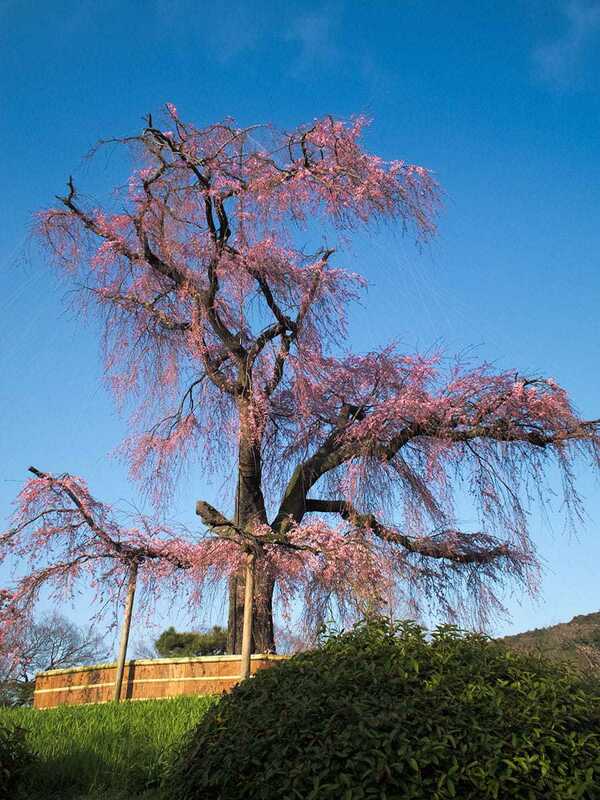 The most famous is the weeping cherry tree (pictured below). It’s known as “Gion-no-Yozakura” or the night time cherry of Gion and despite being over 70 years old it still puts on a stunning display. 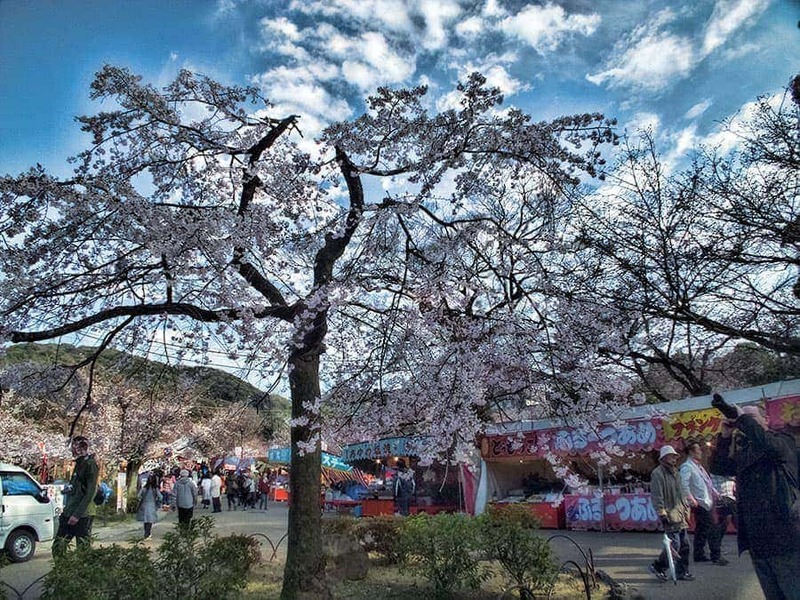 During spring blossoms all kinds of festival food can be bought and enjoyed beneath the pretty pink sakura petals and many families and groups bring their own blue tarpaulins and picnics to spend the day and stay well into the evening in the park. This park converted me to toffee strawberries (naughty) and fed my obsession with Takoyaki (very naughty) – like festival food anywhere in the world it’s not for the super healthy eater. Until 300 years ago the area was pretty much deserted, covered in scrub and weeds. In 1886 it was designated as a park and work was started to enlarge and beautify it. 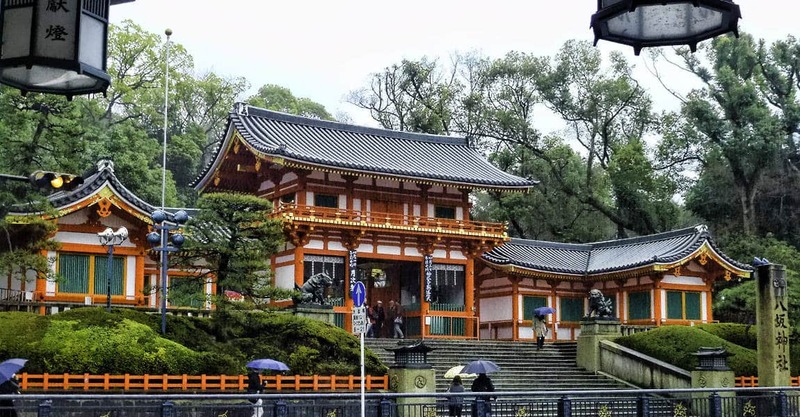 In 1913 Jihei Ogawa, a well known garden designer who had previously worked on prestigious projects such as Heian Shrine redesigned it creating the structure that’s in place today. The garden is a fairly typical Japanese design known a Kaiyu, or walking around the pond layout. It provides a green space for residents and workers in the area and a gathering place for events and festivals. 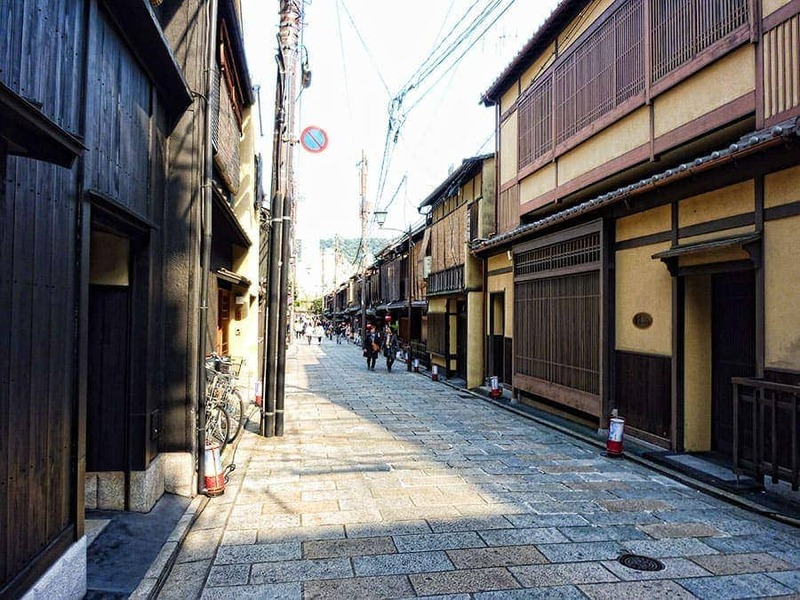 The Gion Geisha district is arguably the most famous in all of Japan. It includes all the area in in front of Yasaka shrine; both to the right and left of Shijo. 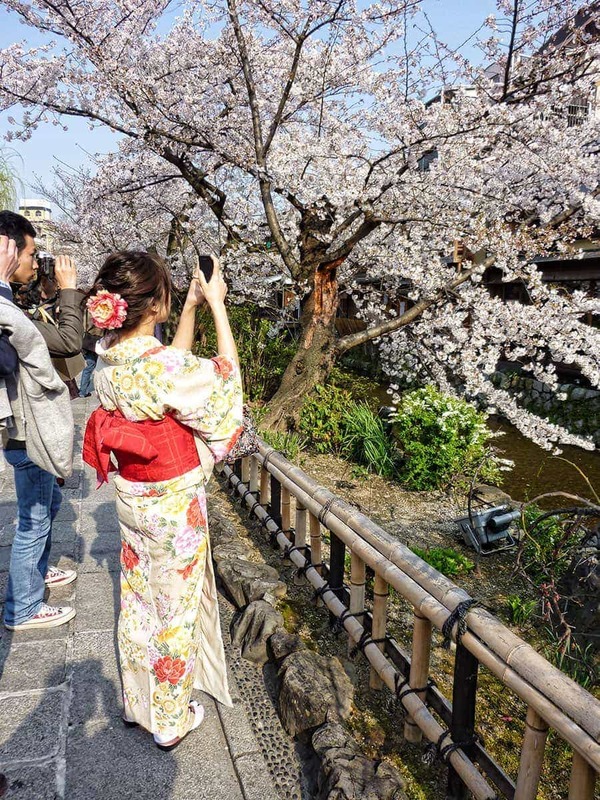 The Hanami-koji area which runs left from the intersection of Shijo and Kawabata Dori is a beautifully preserved historical district and in the back streets through here is one of your best chances to spot a Geiko or Maiko heading off for their evenings work. If you are lucky enough to spot one the city asks you to be respectful and make way for them to pass. If you are able to recognise them by their dress they are working and shouldn’t be asked to pose for photos or be delayed. 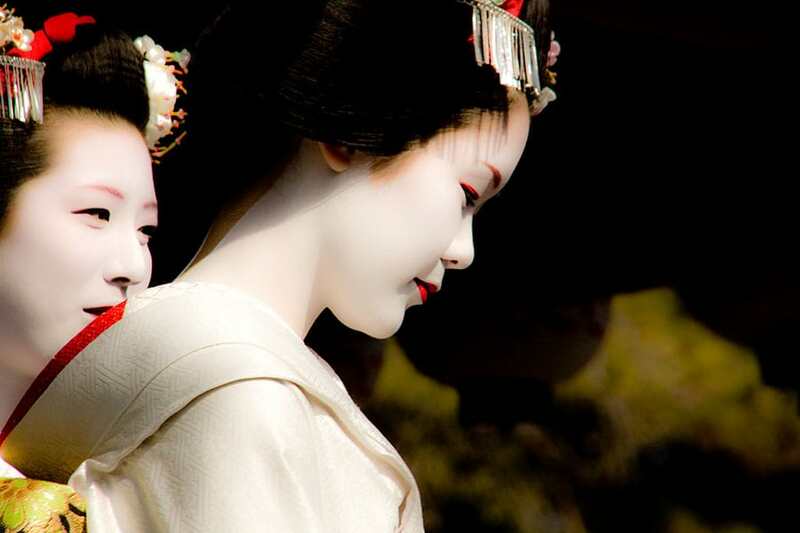 There are relatively few Geisha still working in Japan and it’s far more likely if you spot one on the street that you’re seeing someone who has paid to be dressed and being made-up in a similar style for fun. Through this area you will see the cobbled streets and traditional homes and tea-houses. Many have been converted into restaurants but the traditional facade remains in place. 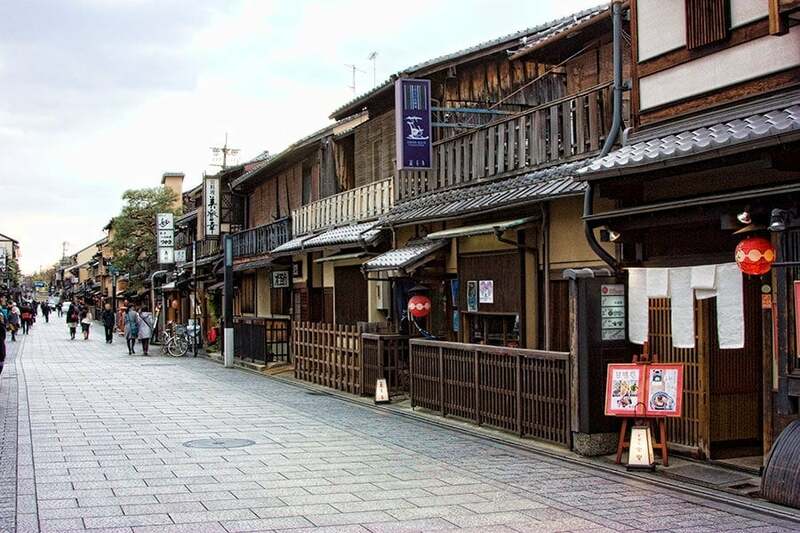 This area runs back south to the Gion Theatre, home to the Miyako Odori spring dance and to Kennin-ji temple. 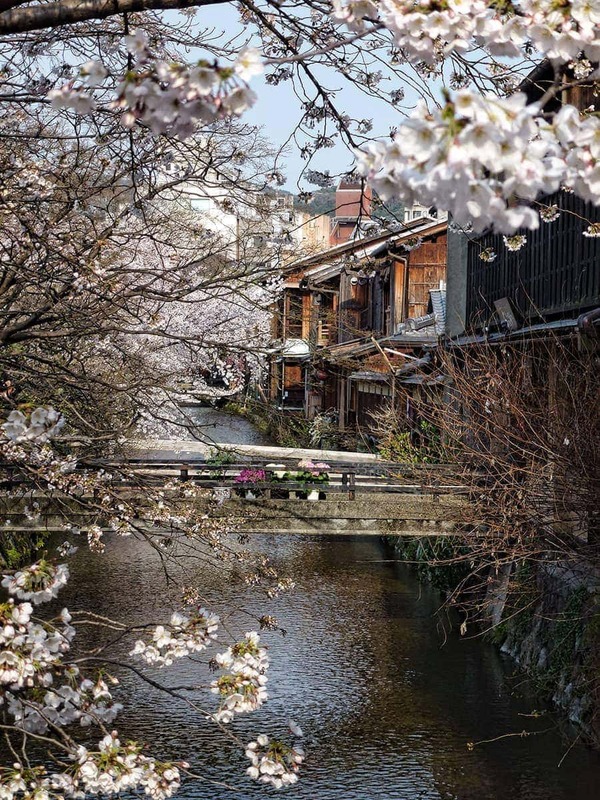 The Shirakawa Canal is about 5 minutes north of the Gion main street, just up from Shijo and is well worth a look particularly if (a) you’re there during cherry blossom season or (b) you are a long time fan of the book Memoirs of a Geisha. 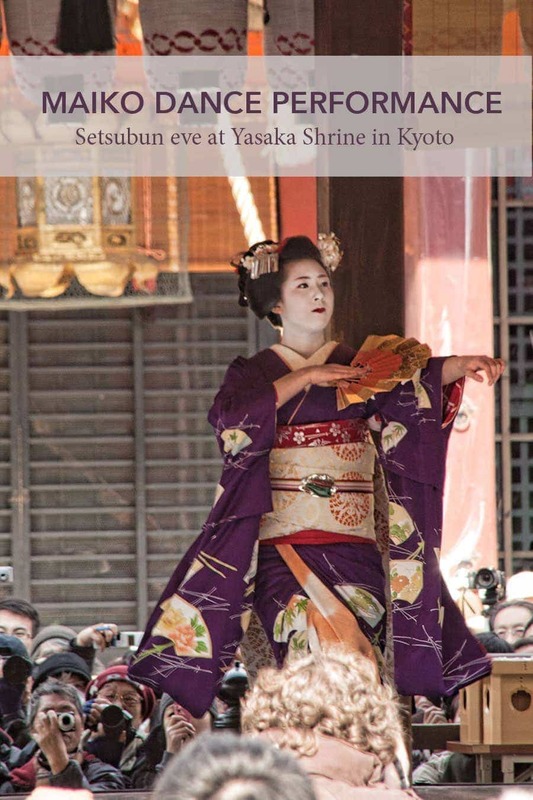 Several hints in the (fictional) book indicate it was based in this area including references to the famous Geiko, Mineko Iwasaki, who lived just moments from here. Iwasaki-san interviewed with Arthur Golden as background for the book but he was sued and settled with her for breaching confidentiality when her name appeared in the books acknowledgement and parallels to aspects of her life appeared directly in the book. It’s a very pretty area and well worth a walk through either by day or when illuminated in the evenings. 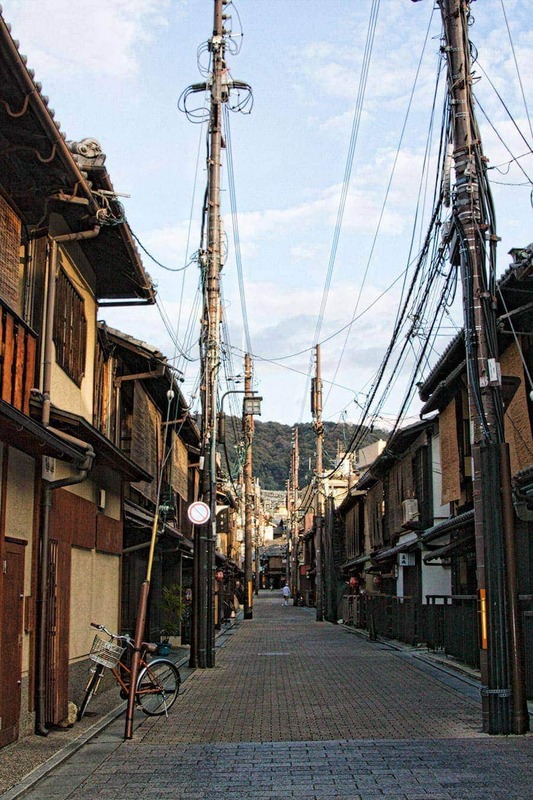 Kyoto, like most of Japan is extremely safe. I have no concern walking around the city after dark. Next week we’ll pick up our photo-walk heading further north from Maruyama park. Thanks for joining us again this week to explore Eastern Kyoto. I love Kyoto. It’s probably my favourite Japanese city. Lovely photos. Thanks Christine! I do love travelling around Japan but no matter how many times I stay in Kyoto I find it hard to leave and can’t wait to get back.